Tree felling is the practice of strategically cutting down a tree to use for other resources such as timber or building materials. Tree felling requires much skill and training in order to avoid damage to the surrounding areas in which the tree may or may not fall. Tree felling should only ever be attempted by professionals, so it’s important to consult with them beforehand to avoid personal injury to yourself. Tree felling is performed with industrial-grade tools to cut and saw the tree, so many household lawn care tools you have at home just won’t do. Therefore, using the resources of a professional tree feller is always the most recommend avenue. The direction in which to cut a tree is always taken into considering when tree felling. Many tree fellers must assess the surrounding areas to ensure that if a tree is cut and falls, it does not damage surrounding lawns, structures, or other trees. Depending on the angle in which a tree grows or is slumping, this can determine what direction the tree should be cut in. For example, a tree that leans to the left, may benefit more from being cut on its downward facing curb, opposed to the other direction. To avoid causing harm or injury to surrounding trees, tree fellers must always take into consideration potential measurements and the distance between existing trees. If existing trees are ruptured during the felling of another tree, this could negatively disrupt their growth and cause them to decay or deteriorate quicker. Rather than sawing straight through a tree, many tree fellers will use notches to slowly chip away at the stump of the tree for removal. Repetitive notches are used to gradually cut the tree and minimize sudden falling. As the tree feller continues to notch the tree, the initial notch will grow and allow for the tree to lose balance and fall in the intended direction that the feller wants it to. Notches are usually a longer technique used, but provide equal amounts of success when cutting trees. 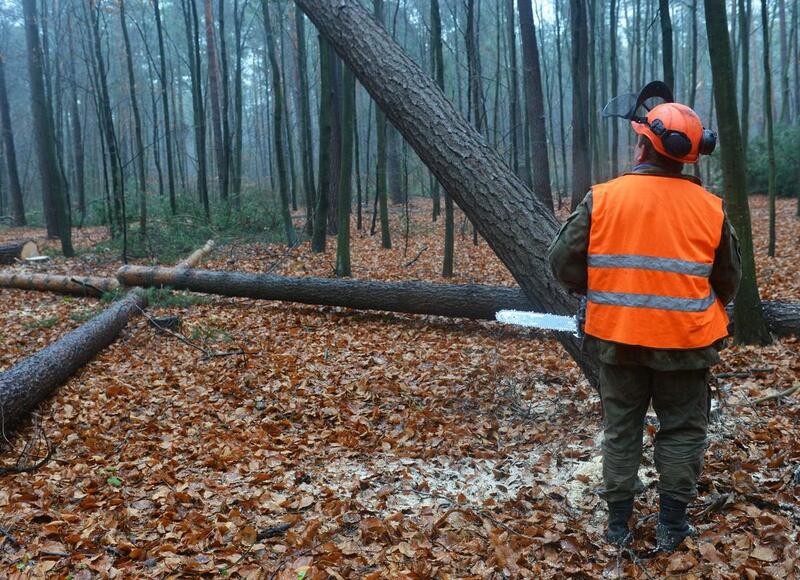 Once the tree has been cut, you’re likely left with a high stump. If you’re unhappy with the stump or would like its appearance reduce, we can provide stump removal or stump grinding services. Stump removal does just that, removes the stump from the ground up and can often leave a larger or protruding hole in the ground in place of it. Since many clients don’t appreciate the appearance of the whole, they’ll often opt for stump grinding, which is less invasive and tends to look better on the lawn. Stump grinding is performed on tree stumps that hare not infested with disease or pests, otherwise these hindrances could affect the grass and plants around the stump. Over time, the stump may grow slightly and will need to be grinded again to reduce its appearance if you’re unhappy with it. Otherwise, most plants will continue to grow over it.